Welcome back for the conclusion of my interview with Elaine S. Reisman. 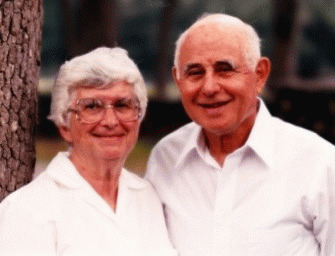 Elaine's husband Bernie suffered from Alzheimer's Disease for the last sixteen years of his life. Before we broke, we were going to talk about how Alzheimer's affected your life as a couple, Elaine. What can you tell us? ESR: We continued to have an active social life, entertaining and having lots of company for dinners and visiting. Old friends invited us out but it was more difficult for friends who knew us before the dementia. This was not the man they knew. So, it was easier to socialize with new friends whom we met through support group and day care, because they knew him as he was at that time. We also still took some trips, even venturing overseas as we were accustomed to doing; however, Bernie's constant questioning sometimes became annoying. I covered for him as much as possible, but then would explain (out of his hearing) that he had Alzheimer's. JB: In what other ways did the illness impact your lives? ESR: Although we continued to travel, the trips were stressful for me. But I was glad that we could still do them as we enjoyed traveling. The problem with traveling was that if he had to go to the men's room, I had to wait outside and hope that all was well. Once, while I was sitting with our luggage, Bernie came out and headed in the wrong direction. I had to abandon our luggage and run after him. I wondered then whether it was really worth it to travel. View All 24 Articles in "behavior/psychology"
View All 24 Articles in "health"
Other Series: View All 14 Articles in "Illness"
Other Series: View All 1 Articles in "Alzheimer's"